THE Papua New Guinea women’s rugby league team now have a name, the Orchids, which was officially announced yesterday in Port Moresby. The event saw the PNG Rugby Football League release its 30-member squad for the Women’s Rugby League World Cup which will be staged in Sydney in November. The women’s national team logo was unveiled while the naming rights sponsor, Oil Search, was formally announced. PNGRFL chairman Sandis Tsaka said the process that was undertaken by the league to find a new name and brand for the women’s national team was a testament to the importance the league had placed on the women’s game. He said the name Orchids was reflective of the country’s unique flora and fauna. 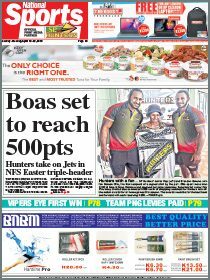 Tsaka said he was proud because it was an important first step PNG women’s rugby league was taking and they could now consider themselves a member of the international rugby league community. Although the PNG women’s team have yet to play a match, they will get that opportunity before the World Cup when the Jillaroos, Australia’s national women’s team, travel up with their Prime Minister’s 13 for the annual fixture at the end of the month. “The national women’s rugby league has not had a formal name and in fact have yet to play an international match,” Tsaka said. “The name of the national team was approved by the PNGRFL board in March this year. The PNG Orchids 30-member squad will now going into training for the Prime Minister’s 13 curtain raiser on Sept 23 and then the Women’s World Cup (Nov 16-Dec 2). 2017 Rugby League World Cup chief executive Andrew Hill confirmed that the Jillaroos would play the Orchids as the curtain raiser to the PMs’ 13 fixture at the National Football Stadium. Orchids naming rights sponsor Oil Search Limited was represented by managing director Peter Botten who said his company which has its roots in the country was proud of being associated with the country’s number one sport as well as being part of the women’s game. 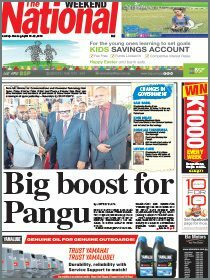 “We are proud to sponsor PNG’s national sport through direct sponsorship and also through the National Football Stadium,” Botten said. Representing the Papua New Guinea womenfolk during the event Mrs Lynda Babao-O’Neill, wife of Prime Minister Peter O’Neill officially unveiled the PNG Orchids logo. She congratulated the Papua New Guinea Rugby Football League for their efforts in developing and promoting the women’s game. PNG Orchids squad: Barbar Selsel, Carol Humeu, Cathy Neap, Elvina Aaron, Freda Waula, Grace Mark, Jenifer Michael, Joan Kuman, Maima Wae, Margaret Papo, Martha Karl, Naomi Kaupa, Shirley Joe, Akosita Baru, Anna Oiufa, Brenda Goro, Christy Roulage, Della Audama, Elava Turpa, Gloria Kaupa, Helen Abau, Jacobeth Ware, Shirley Jerry, Vero Waula; Shadow players: Anas Lingiliket, Atua Arek, Barbra Andrew, Fay Sogavo, Mala Mark, Melisa James. Coach: Dennis Miall.